Range: Found throughout Kansas east of the High Plains; ranges west into the High Plains only along the aquatic corridors of river valleys. Description: Harmless. Keeled scales. Three yellow body stripes, those on each side of body situated on second and third scale rows (counting from belly up); pattern of black spots on a redbackground between the stripes on the back. Belly is white, greenish or gray, with a row of small dark spots along edges. Young look like miniature adults. 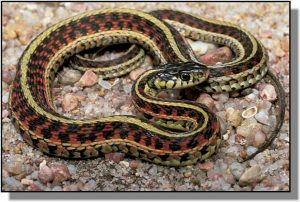 Note: Snakes of this species from extreme southwestern Kansas (Comanche to Seward counties) may lack red color on the back between the dorsal and lateral stripes. Habits: Found in a wide variety of habitats, including marshes and wet meadows, margins of ponds, woodland and woodland edge, floodplains and cultivated fields; prefers areas with moderately moist vegetation. Active from March to November. Home range of 22–35 acres; estimated population density of three of these snakes per acre in northeast Kansas. Young born in late summer or fall; litters are large, varying from 4-85. 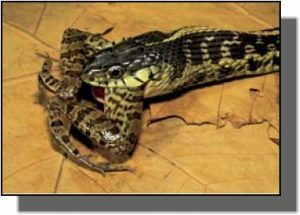 Feeds chiefly on frogs and earthworms; occasionally eats toads, small mice, and other small snakes.